The SF380A Visual-Only Patient Station controls two dome light bulbs, senses button presses and switch closures, and provides routine, bath emergency, and code calls (when partnered with the proper peripheral switches) to the Tek-CARE® NC300II central equipment for display at the system master stations. The SF380A provides routine call input via a push-button call cord, and can signal a cord out call. 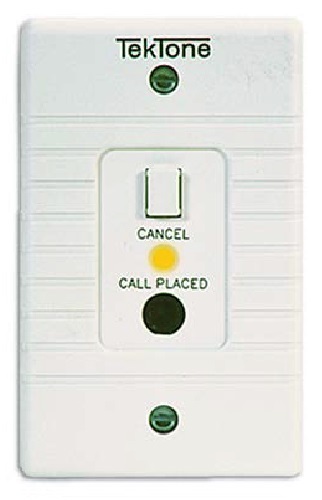 When used with an emergency switch, it provides a medium priority bath emergency call. When used with a code switch, it provides a high priority code call. The SF380A also has a smoke detector input. Station addressing uses a 7-position dipswitch. Six switches set the station address; the seventh switch determines whether lamps are supervised. The SF380A is a drop-in replacement for the SF380C, with dipswitch-selectable lamp supervision. Construction: Flame-retardant (UL® 94V-0) plastic faceplate. All electronic components are circuit-board mounted. Connections: Plug-in connectors for all wiring. Housing: Single-gang ring & double-gang back box.